What Facts Should I Know about ARDS? When should I seek medical care for ARDS? What are the exams and tests for ARDS? What is the treatment for ARDS? What medication are used to treat ARDS? What is the follow-up for ARDS? How can I prevent ARDS? What is the outlook for ARDS? What Is the Medical Definition of Acute Respiratory Distress Syndrome? aspiration (fluid entering the lungs, especially stomach contents). In many cases, the initial event is obvious, but, in others (such as drug overdose) the underlying cause may not be so easy to identify. ARDS typically develops within 12-48 hours after the inciting event, although, in rare instances, it may take up to a few days. 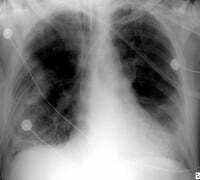 Persons developing ARDS are critically ill, often with multisystem organ failure. It is a life-threatening condition; therefore, hospitalization is required for prompt management. What Are the Early Signs of Respiratory Distress? ARDS is associated with severe and diffuse injury to the alveolar-capillary membrane (the air sacs and small blood vessels) of the lungs. Fluid accumulates in some alveoli of the lungs, while some other alveoli collapse. This alveolar damage impedes the exchange of oxygen and carbon dioxide, which leads to a reduced concentration of oxygen in the blood. Low levels of oxygen in the blood cause damage to other vital organs of the body such as the kidneys. Who Is at Risk for Developing ARDS? ARDS occurs in children as well as adults. What Does ARDS Look Like? A number of risk factors are associated with the development of ARDS. Because ARDS is an urgent medical condition that typically follows a significant illness or injury the patient is usually already hospitalized when ARDS develops. Anyone developing severe shortness of breath should see a health care provider immediately. Arterial blood gas analysis reveals hypoxemia (reduced levels of oxygen in the blood). A complete blood count may be taken. The number of white blood cells is increased in sepsis. Chest X-ray will show the presence of fluid in the lungs. CT scan of the chest may be required only in some situations (routine chest X-ray is sufficient in most cases). Echocardiogram (an ultrasound of the heart) may help exclude any heart problems that can cause fluid build-up in the lung. Monitoring with a pulmonary artery catheter may be done to exclude a cardiac cause for the difficulty in breathing. Bronchoscopy (a procedure used to look inside the windpipe and large airways of the lung) may be considered to evaluate the possibility of lung infection. Persons with ARDS are hospitalized and require treatment in an intensive care unit. No specific therapy for ARDS exists. Intravenous fluids are given to provide nutrition and prevent dehydration, and are carefully monitored to prevent fluid from accumulating in the lungs (pulmonary edema). Corticosteroids may sometimes be administered in ARDS or if the patient is in shock, but their use is controversial. Patients with ARDS may require a prolonged period of rehabilitation for both respiratory problems and muscle weakness. After discharge from the hospital, the person should follow-up with his or her healthcare provider for a lung function assessment. Because aspiration is a risk factor for ARDS, taking appropriate measures to prevent aspiration, such as elevation of the head of the bed, may prevent some cases of ARDS. Outlook of persons with ARDS has improved over the last 20 years and a majority of people survive. Persons with a poor outlook include those older than 65 years and those with sepsis as the underlying cause. The adverse effect of age may be related to the underlying health status. Survivors of ARDS may recover normal lung function. However, some of them may have residual lung impairment or persistent muscle weakness. Typically, the lung dysfunction is mild, but ARDS can lead to severe lung damage and a reduced health-related quality of life. Severe disease and prolonged duration of mechanical ventilation are predictors of persistent abnormalities in lung function. "Acute respiratory distress syndrome: Clinical features and diagnosis in adults"
What were the symptoms of yours, or your loved one's ARDS? What treatment did you receive for Acute Respiratory Distress?